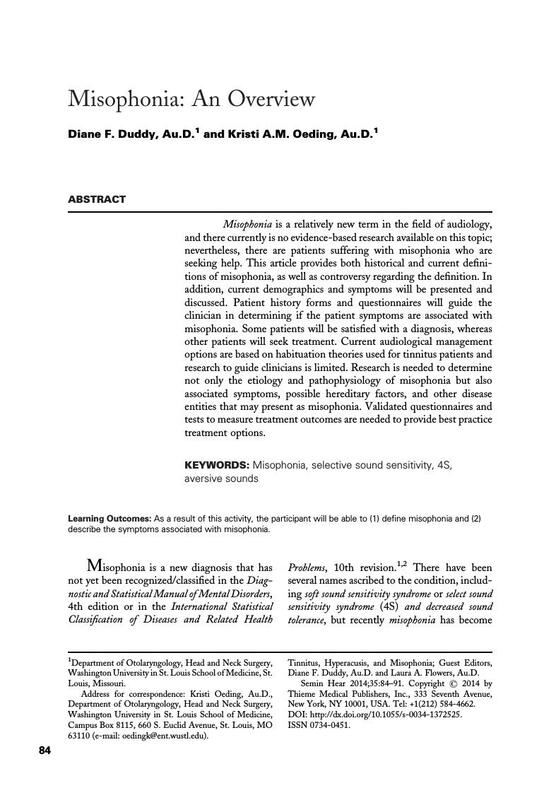 Misophonia is a relatively new term in the field of audiology, and there currently is no evidence-based research available on this topic; nevertheless, there are patients suffering with misophonia who are seeking help. This article provides both historical and current definitions of misophonia, as well as controversy regarding the definition. In addition, current demographics and symptoms will be presented and discussed. Patient history forms and questionnaires will guide the clinician in determining if the patient symptoms are associated with misophonia. Some patients will be satisfied with a diagnosis, whereas other patients will seek treatment. Current audiological management options are based on habituation theories used for tinnitus patients and research to guide clinicians is limited. Research is needed to determine not only the etiology and pathophysiology of misophonia but also associated symptoms, possible hereditary factors, and other disease entities that may present as misophonia. Validated questionnaires and tests to measure treatment outcomes are needed to provide best practice treatment options.